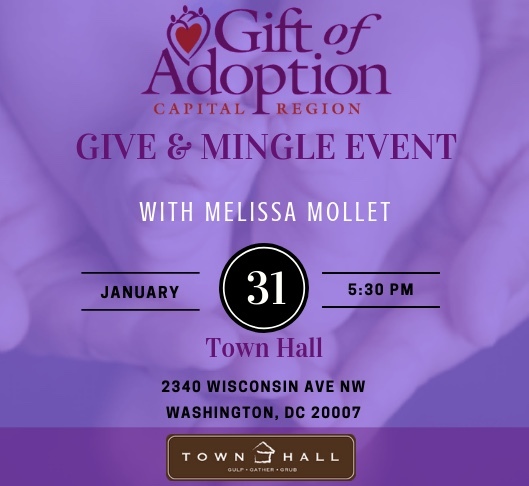 The Capital Region Chapter of Gift of Adoption invites you to attend our 3rd annual social & cocktail event to promote awareness and raise funds to complete the adoptions of vulnerable children into loving homes in the Capital Region. Join us to learn how you can help transform the life of a child. NBC4’s Emmy Award-winning news journalist Melissa Mollet will be the featured keynote for the evening. She and her husband are the proud parents of three children including daughter Barrett Mae, who they adopted in 2016. Melissa will share her very inspiring and life-changing adoption experience with event patrons.